Feeling Stressed over the Holidays? Sure, those words definitely apply. But there’s one more that I’d add to the list: STRESS. Not to be a Grinch, but sometimes I’m so worried about making sure everyone else has a magical Christmas that I forget about enjoying my own holiday. By the time December 25th rolls around, I’m so exhausted from cleaning the house, cooking food, and wrapping gifts that I can barely keep my eyes open. No matter how early I start planning, I never seem to get things done. Even when I do get everything crossed off my list early, I think, "Great! Since I have extra time, I should run to the store to get the things to bake those cookies that Uncle Mark loves." Am I crazy?? Probably. The big holiday dinner, family obligations, being responsible for carrying out yearly traditions, shopping for gifts, and the hundreds of other little things that go along with big holiday celebrations can be wonderful. It can also be stressful. The holidays are supposed to be merry and bright. But sometimes they can just seem overwhelming. To help those struggling with rising stress levels around the holidays, check out our recorded webinar on stress management with DISC. 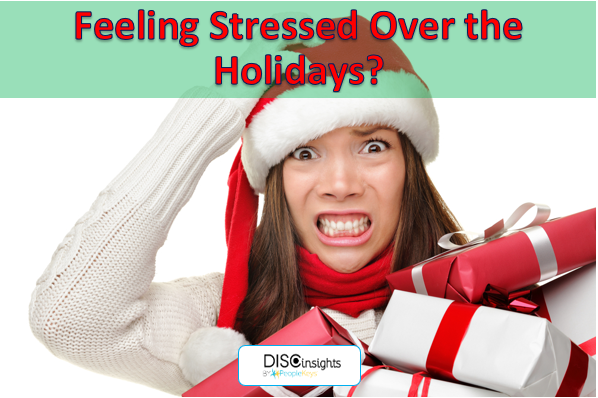 The How to Beat Holiday Stress webinar covers strategies for identifying personality-specific triggers for stress and for better coping with stress using your DISC personality type as a guide. Taught by master DISC coach John Schindell, it explores how stress is experienced by different people in different ways and will help participants identify individual stress triggers that, with training, can be anticipated and avoided. Read more about some strategies to help others cope with holiday stress!